Please share a bit about each of your journeys to embrace fashion design as a career. ​Our journeys started in childhood, having been raised with our siblings in an art studio in Nanaimo, with both of our parents being artists. Our upbringing was essentially an immersion art class, working in multi-media such as pottery, painting, silk screening, carving, music and textile arts. We were also enrolled in local Fashion Shows, modelling for a Children's store and having our make-up done by the elderly lady at the Simpson Sears cosmetic counter at our local mall. Our parents eventually had a Coast Salish clothing line of garments designed by our mother Sandra Moorhouse-Good that featured our dad, William Good's, art called Ay Ay Mut. We grew to be involved in the family business, learning elements of design, wholesale, retail, and eventually putting on our own community Fashion Shows. After our parents' retirement and many years out of the industry, we had a show at the Nanaimo Museum celebrating our parents' 35 years of artistic collaboration which inspired us to start again, and that is how Ay Lelum came to be. ​Our foundational skills of art, form and design were learned over many years studying art under our parents, and having been taught to apply these skills to a chosen art form - ours being garments. Our sales and consumer skills have been learned by listening to the customer and being influenced by their desires, such as eco-friendly fabrics and locally produced garments that reduce their environmental footprint. Our manufacturing skills have been developed by years in the industry, also with Aunalee having worked in Vancouver's garment manufacturing industry briefly in the late 1990's. Our design and construction skills have been learned through the mentorship of our mother, as she continually teaches us and oversees every collection we design and produce at our family home and studio in Snuneymuxw (Nanaimo). Who you are as a designers? Aesthetic? Customer? Brand? ​We are a second generation Coast Salish design house, having built our own brand while honoring our parent's legacies. We embrace diversity, creating all-inclusive garments for everyone regardless of background, ethnicity, age or size. Our garments are designed for people who want to support local designers and artists, those who like comfortable and elegant pieces of wearable art. What comes easiest for you as a designers? What is hardest? Are there any special challenges that arise when you have more than one designer creating a collection? ​We are fortunate, in that our family of artists work exceptionally well together. We all have an understanding and respect for each other and this makes the process easier to work collaboratively. Although there are creative challenges when there is more than one designer, the ultimate creation happens when we work on the same idea at the same time, unbeknownst to each other, which makes it all come together seamlessly. The combination of our ideas always has the best outcome. Where do you find inspiration for new collections? How important is colour to your design process? How do you come to incorporate the work of local artists into your design work? ​Our inspiration comes from the rich cultural history, art and songs taught to us by our father, William Good. Not only is he a master carver and traditional storyteller and singer, he is the artist responsible for revitalizing the traditional Coast Salish style in our region. Through his teachings, we are able to develop his and our brother Joel Good's artwork onto garments and record original music that tells the stories in our clothing. The process of singing and recording music works with our design process, as they influence each other. We often envision the garments walking the runway while working in the recording studio, and the songs become the reflection of the collection. The overall artistic process creates a cultural experience for the audience, appealing to multiple senses. Readers would love to know more about the current collection you showed at Vancouver Fashion Week. Can you describe it for us - aesthetic, fabrics, palette, silhouettes, inspiration, etc.? ​Our VFWFW19 collection, "K'wuyucun~Grizzly Bear" is inspired by our father's story and family song of the first grizzly bear ever. The collection showcases ready-to-wear garments that are manufactured in BC, as well as our Coast Salish Couture pieces that are made by custom order. The artwork is by our brother Joel Good and father William Good, created in the traditional Coast Salish style from Snuneymuxw (Nanaimo). The designers' favourite look if the silver coat and dress on the far right above! Do each of you have a favorite look in this collection? 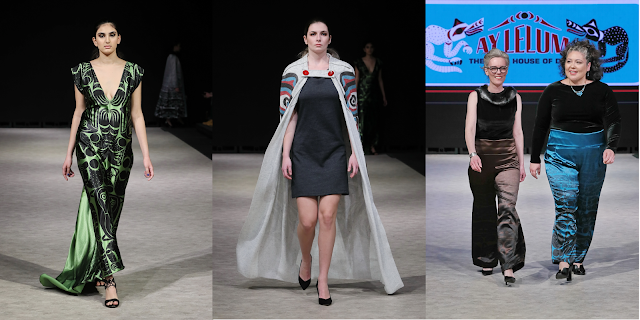 ​Our favorite look is our Coast Salish Couture Grizzly Bear Coat and Dress, in silver with black bears, worn by Rylie Teegee. Where can readers purchase your designs? ​Our garments are available at a variety of galleries and fine gift stores, such as the Nanaimo Art Gallery and on select BC Ferries Passages Gift Shops, as well as on our website www.aylelum.com. A list of retailers can also be found on our website, and we are often found set up at cultural events and shows. What's next for you as a designer and your brand? ​To continue to expand and grow both our brand and our collections. We have already started planning for 2020! What advice do you have for young fashion artists just beginning their journey to become designers? ​Do your due diligence in design and market research, focus on what makes you unique, find a support system, and follow your dream!